ANTIQUE CITY MAP OF MANHATTAN. ANTIQUE, UNCOMMON WASHINGTON DC MAP. The map was carefully removed from an atlas. It is a centerfold. 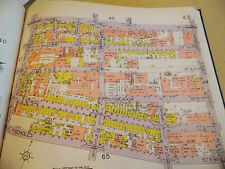 ANTIQUE, UNCOMMON NEW YORK CITY - MANHATTAN MAP. The map was carefully removed from an atlas. It is a centerfold. 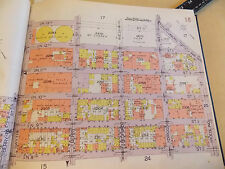 1922 LAWYERS MORTGAGE COMPANY'S MAP OF BROOKLYN N. Y. CITY - 25 1/2" X 31"
The cover is soiled with slightly creased corners, but intact. There is no handling fee. Antique 1921 OLD Atlas City Map San Francisco, California CA & Seattle, WA L@@K! 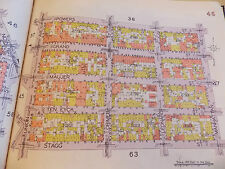 Great OLD Map from the P.F. COLLIER & SON "NEW WORLD ATLAS & GAZETTEER". San Francisco, California on 2 Pages. On The Back Of The Eastern Half Is A Map Of Seattle, Washington. Very Educational. See what this City used to look like! ANTIQUE MAP OF MONTREAL CANADA. The map was carefully removed from an atlas. Great OLD Map from the COLLIER'S "THE NEW WORLD ATLAS & GAZETTEER". Teachers, Students, Authors, Historians, Artists, Real Estate Agents, Interior Decorators & Politicians LOVE Them! Very Educational. Beautifully drawn with excellent detail. They are direct :1 to :1 high resolution reproductions from the originals, not downloaded copies of copies of copies. 1876 Texas County - S.A. Mitchell. 1860 Texas County - S.A. Mitchell. 26" x 36" antique map, cities and distances, on back the populations of Missouri towns based on 1920 census. 1920 Fort Ft Worth TX City Street Map-24" by 18"
They are direct :1 to :1 high resolution reproductions from the originals, not downloaded copies of copies of copies. 1876 Texas County - S.A. Mitchell. 1860 Texas County - S.A. Mitchell. This size is creates a striking effect on den and office walls. This is a huge BLACK & WHITE COPY (NO COLOR) of an original 1924 map titled Can't Beat the Price for this GIGANTIC MAP! Check out the very first RADIO STATIONS of the United States! Map is MUCH SHARPER than images shown. This hardcover book was published in 1929. These were also heavily used in real estate offices throughout the years. I believe he died in 1958. I find this to be very interesting and love the addition. Great OLD Map from the "COLLIER'S NEW WORLD ATLAS & GAZETTEER". It Is Slightly Yellowed, As Expected, From Age. Very Educational. See what the City used to look like! Musicians, Teachers, Students, Artists, Historians, Authors, Real Estate Agents, Interior Decorators & Politicians LOVE Them! Land Book of the Borough of Manhattan City of New York, published in New York by Bromley & co., 1921. A facsimile copy of the title page will also be included for authenticity. It is handcolored probably with the use of stencils typical of the period. 1920 Fort Ft Worth TX City Street Map-36" by 24"
Nice Antique 1924 OLD Atlas City Map Providence, Rhode Island RI Vintage L@@K! Rhode Island. Great OLD Map from the "COLLIER'S NEW ENCYCLOPEDIC ATLAS & GAZETTEER OF THE WORLD". Very Educational. See what the City used to look like! The Map Looks Fantastic! 95 Years Old! A Really Nice Gift! RARE 1929 MAP OF THE CITY OF SUPERIOR !!! VERY DETAILED, MINNESOTA 30 X 57 IN. See key for what all the symbols indicate. The coverage area also includes the city's Chinatown, although it is not labeled on this map. There are no Freeways and no Dodger Stadium on this map, and construction of the venerable Los Angeles Coliseum had not yet been completed when the map was drawn. The towns are indexed in the margins with populations. 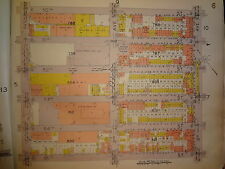 The map is not mounted nor matted, being sold as a single sheet as seen in the first pic with a centerfold as issued. An Original Antique Map: Not a Modern Reproduction! Antique / Vintage 1924 Brooklyn & Long Island Atlas Map NY New York City L@@K! Brooklyn, New York (Part of The Borough of Kings) New York City, NY. NEW ENCYCLOPEDIC ATLAS & GAZETTEER of The WORLD". New York City. Great OLD Map from the "COLLIER'S. Very Educational. See what the City used to look like! Condition in my opinion: Slight shelf and storage wear. Paper is in very good condition. Wisconsin, Green Lake Co. Map City of Green Lake Twsp 1923 dbl pg-side K10#88. Presented is an authentic old map taken from a dis-bound plat book published in 1923. Original Color. Map reverses to Markesan, Dalton, Manchester & Green Lake County. Map is generally in Good- condition. Creases in the corners. The map has fantastic coloring to it. There is a crease up the middle from where it was bound. There is also a tear up the middle crease. This is an original 1925 Kansas City, Missouri Tuttle-Ayers-Woodward Co. Pl at Atlas Map that includes Kansas City Zoo, Swope Park and Gold Course, Goose Island, Northeast Industrial Park, Isle of Capri Casino, Kansas City Flying Field, and other noteworthy buildings and structures. 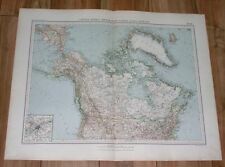 Vintage 1921 Post WWI Atlas City Map Detroit, Michigan MI & Dublin Ireland L@@K! On The Other Side Is a Small Map of Dublin, Ireland and Environs. Great OLD Map from the COLLIER'S "THE NEW ENCYCLOPEDIC ATLAS & GAZETTEER OF THE WORLD". Very Educational. See what the City used to look like! Minneapolis & Saint Paul, Minnesota And Montreal, Quebec. On The Other Side Is A 9 1/4" x 12 5/8" Map of Montreal, Quebec, Canada. Great OLD Map from the COLLIER'S "THE NEW ENCYCLOPEDIC ATLAS & GAZETTEER OF THE WORLD". Great OLD Map from the COLLIER'S "THE NEW ENCYCLOPEDIC ATLAS & GAZETTEER OF THE WORLD". 1926 Edition. It Is Slightly Yellowed, As Expected, From Age. Musicians, Teachers, Students, Artists, Historians, Authors, Real Estate Agents, Interior Decorators & Politicians LOVE Them! Unfolded and mounted on paperboard and sheathed in plastic. It is fromThe Literary Digest Atlas of the World and Gazetteer, published by Funk & Wagnalls, 1927, a copy of the title page is included. There is a similar map of another state on the reverse. 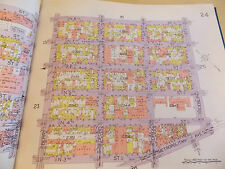 Condition: The map is in Very Good condition with tonal aging and darkening around the edges, otherwise it is very clean, see the pics for more on condition. Antique / Vintage 1928 Small City Map Of Rome, Italy & Environs Post-WWI L@@K! Great OLD Map from the "COLLIER'S. Very Educational. See what the City & Surrounding Area used to look like! 91 Years Old! The Page Is Lightly Yellowed, As Expected, From Age. Not A Copy. The Actual Page! Antique 1926 Atlas City Map New Orleans, LA NOLA & Newark, NJ New Jersey L@@K! On One Side Is A Map of Newark, New Jersey. On The Other Side Is a Map Of New Orleans, Louisiana. Great OLD Map from the COLLIER'S "THE ENCYCLOPEDIC ATLAS & GAZETTEER OF THE WORLD". Very Educational. Also Madrid, Spain & Manchester, England. Great OLD Map from the "COLLIER'S NEW WORLD ATLAS & GAZETTEER". A Wonderful Antique Gift! Teachers, Students, Historians, Artists, Authors, Real Estate Agents, Interior Decorators & Politicians LOVE Them! It is fromThe Literary Digest Atlas of the World and Gazetteer, published by Funk & Wagnalls, 1927, a copy of the title page is included. There is a similar map of another state on the reverse. An Authentic Antique Map: Not a Modern Reproduction! Antique 1927 Map Of Newark, New Jersey. From Robinson's Atlas 1926. Part Of Ward 16.